This bose headset is used. Sound is really good and powerful the way BOSE is supposed to be. Left Ear Only, Condition is Used, Test Working Normal. Connectivity Technology: Wireless. All buttons and speakers tested. Fully inspected and functional. Wireless convenience, with easy Bluetooth and NFC pairing aided by voice prompts. Australia, Belgium, Canada, Finland, France, Germany, Great Britain and Northern Ireland, Hungary, Malaysia, Netherlands, New Zealand, Norway, Singapore, Spain, Switzerland, Turkey. RATES WILL DIFFER THAN ADVERTISED. COLOR: Black. CONDITION: New. ACTUAL PHOTOS OF THE ITEM . Go Further With Energizing Sound Energize your workout with full, balanced sound that conventional sports earbuds can't match. SoundSport in-ear headphones are sweat-resistant and stay comfortably—yet securely—in place during vigorous exercises. Headphones rubber ear-covers are loose as pictured. Otherwise they work and functions as intended. All buttons and speakers tested. Fully inspected and functional. Wireless convenience, with easy Bluetooth and NFC pairing aided by voice prompts. Trending at $98.30eBay determines this price through a machine learned model of the product's sale prices within the last 90 days. New ListingBose SoundSport Wireless Neckband Wireless Headphones NEW SEALED BLACK! 4.5 out of 5 stars - Bose SoundSport Wireless Neckband Wireless Headphones NEW SEALED BLACK! 389 product ratings389 product ratings - Bose SoundSport Wireless Neckband Wireless Headphones NEW SEALED BLACK! 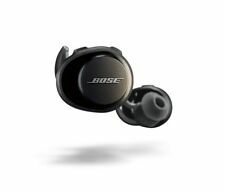 BOSE SOUNDSPORT WIRELESS IN-EAR HEADPHONE BLACK 761529-0010 Black. Free Ship. 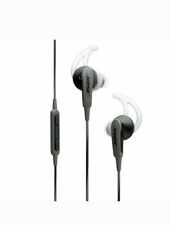 4.5 out of 5 stars - BOSE SOUNDSPORT WIRELESS IN-EAR HEADPHONE BLACK 761529-0010 Black. Free Ship. 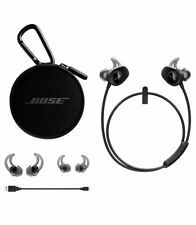 389 product ratings389 product ratings - BOSE SOUNDSPORT WIRELESS IN-EAR HEADPHONE BLACK 761529-0010 Black. Free Ship. Styled in citron these SoundSport Wireless In-Ear Headphones from Bose can pair with up to two devices via Bluetooth, with or without the use of NFC tap technology. These features render them suitable for use during the most vigorous of exercise routines. Used only for couple of weeks and is LIKE NEW. 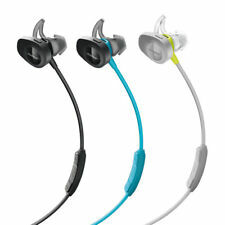 Bose Soundsport Free wireless headphones navy/citron. New never opened factory sealed! These earphones are used and are in good condition. They have been tested and are fully operational and function as intended. Because they are used, there may be minor nicks, scratches, and sticker residue throughout the earphones. 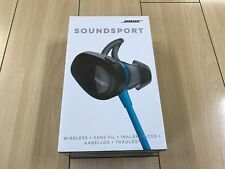 UP FOR SALE BOSE SOUNDSPORT IN EXCELLENT WORKING CONDITION CLENED TESTED AND READY FOR SALE FAST SHIPPING 100 % SATISFIED. Bose SoundSport Free Truly Wireless Headphones - Bright Orange.